Sunset Chateau is located on popular Treasure Island's Sunset Beach~ This direct gulf front Treasure Island Vacation Rental, two-story condo offers a spacious living room, kitchen, seperate dining space for four and full downstairs bath; while the second floor offers the privacy of a guest bedroom w/ 2 full beds, a full hall bath and comfortable master bedroom featuring a KING bed, sliders to a private balcony overlooking the gulf~ Just cant get better than this!~Plenty of room without tripping over each other. The complex has a large heated pool for swimming; A friendly casual Key West attitude exists, quiet and laid back where beach combing is the preferred activity. A perfect destination for those who just want to come and relax. Stay for 3 days or longer !! 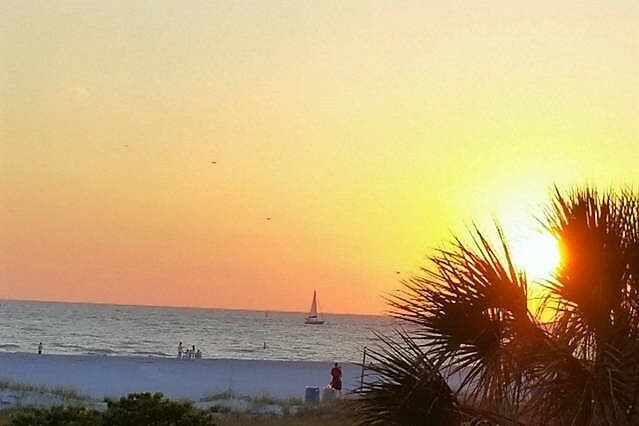 ~ walk to some local fun favorites on the beach for live music, cold cocktails and burger- THINK Jimmy Buffet or a short few minutes drive to many bars, restaurants, shops and much more. **Amenities: Cable/Chromcast tv in main living room, cable/chromecast in master bedroom; smart tv in guest bedroom, Fully equipped kitchen; washer & dryer-same floor; linens, towels provided; onsite grill, (2) vehicle parking permit allowed. (no smoking allowed in the unit or balconies, must be 25 or older to book and remain a guest for entire reservation). Please contact me with information regarding Sunset Chateau 601. Chateau 601 was absolutely amazing. The view was breathtaking. We left the curtains open all night. We never waited to leave. We was late to all of our events . The pictures do no justice. This place is a must stay. We will make this our vacation home every Florida visit. Thank you!! Chateau 601 was absolutely amazing. The view was breathtaking. We left the curtains open all night. We never waited to leave. We was late to all of our events 🤣. The pictures do no justice. This place is a must stay. We will make this our vacation home every Florida visit. Thank you! !